Bucks Survivor: Round Three ~ The Bucky Channel - The World of Sports from Wisconsin's Perspective. Back and forth all weekend long, it seems that Dan Gadzuric is more beloved than Primoz Brezec. Which is kind of like saying a box of turds is better than a pile of crap. It's not Danny G's fault that he became so disliked, he's not the one that threw a ridiculous amount of money at himself when his only conceivable NBA skill was to be tall, that was Larry Harris' fault. But as loathed as Danny G has become over the last few seasons (although I did admire his effort this postseason), only a guy like Primoz Brezec could come in here and lose to him in what became a head-to-head battle. 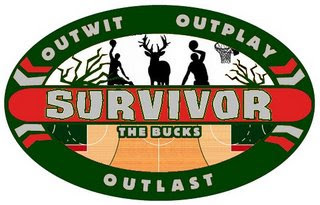 The worst player in the league, Primoz Brezec, has been eliminated from Bucks Survivor. Last Week: Primoz and Gadzuric were put in this position when the Veterans lost their second challenge of the season, as the Young Bucks per player averaged more points per game. John Salmons had immunity yet again, but you could say that Stackhouse, Ridnour, and Kurt Thomas did too because none of them picked up a vote this time around. Pretty impressive just how bad Danny G and Brezec are. The Veterans are now left with five players, while the Young Bucks still have their full eight. This Week: We're going back to scoring average this week, but this time looking at the remaining players and their scoring average in their playoff series against the Hawks to see who played hard when it mattered. Something tells me that the lack of Bogut and the number of guys left remaining will actually hurt the Young Bucks in this one. Something also tells me that I rigged it that way to even the teams out a bit. Results: Young Bucks - Jennings (19.3), Delfino (11.2), Ilyasova (9.2), Mbah a Moute (8.5), Ivey (1.0), Bell (0), Jackson (0), Bogut (0). That's eight guys for an average of 6.15 PPG. Veterans - Salmons (18.0), Ridnour (8.5), Stackhouse (8.5), Thomas (5.3), Gadzuric (3.2). That's five guys for an average of 8.7. Contest rigged successfully. Voting: Brandon Jennings will earn immunity, with seven players left for the chopping block. Voting can be done on the top right of this blog, and the polls will close Friday night at 6pm. Happy voting, and check out the season in review so far here.